Your ‘Food is Medicine’ was a concept originally attributed to the founder of modern medicine – Hippocrates. Ironically today very few in the medical community have a deep understanding of nutrition. This is not a criticism of modern medicine – but a reflection on how far the training of our medical community has been taken away from understanding the most important factor in fighting chronic diseases, many cancers, inflammation, pain and mental health – and that is Nutrition. One of the Doctors in the Australian medical community who has gone against this trend is Dr Peter Brukner. Based on his own experience with treating a chronic disease – Peter Brukner studied the effects of nutrition on fighting disease and now champions the cause for proper education throughout the community. 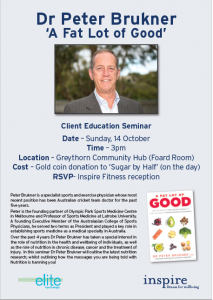 Inspire Fitness for Wellbeing is pleased to host our upcoming seminar being conducted by Dr Peter Brukner on the latest research in nutrition science. The goal of this seminar is to inform you on the role of your nutrition in preventing and treating chronic diseases – and in achieving optimal health. Inspire Fitness has partnered with Elite Myotherapy to present this seminar. We value the role of nutrition in achieving optimal health and support the education campaign that Dr Peter Brukner has embarked upon. We welcome non-members and clients to attend – however we do require your to RSVP. The cost of this seminar is free – however a gold coin donation for the organisation ‘sugar by half‘ will be appreciated. We look forward to seeing you on Sunday 14th October at 3pm. This video provides an overview from Dr Peter Brukner.